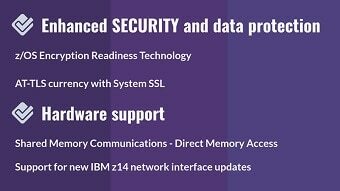 IBM® z/OS® Communications Server, a high availability enterprise transaction and data server, provides common applications, such as FTP, Telnet and the remote execution of applications. Built for optimum productivity, it provides a secure platform for developing and sharing mainframe workloads. 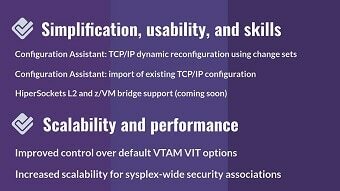 IBM z/OS Encryption Readiness Technology (zERT) Network Analyzer, a new z/OSMF plugin, is now available for you to easily query and analyze the cryptographic protection attributes of your z/OS TCP/IP and Enterprise Extender connections. Supports high-bandwidth and high-speed networking technologies, including Shared Memory Communications (SMC), which provides significant performance improvements for TCP protocol workloads. 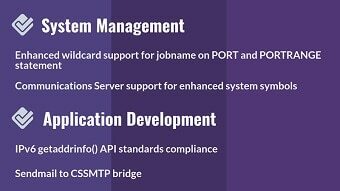 Uses z/OS Parallel Sysplex® technology to enable high availability application support. Protects sensitive data and the operation of the TCP/IP stack on z/OS. Enables IPv6, the successor to aging IPv4 technology, to handle the demands of internet usage with 128-bit addressing. Collects network topology, status, and performance information. Makes it faster and easier to configure policy-based networking functions by using Configuration Assistant.